It took me quite some time to come up with the perfect tablescape for the dining room table. I can’t even begin to tell you how much buying, returning and rearranging I did. And look what I ended up with – simplicity. My mom bought the vase (Pottery Barn) and twigs to use as a picture display at our wedding a few years back and of course she wanted me to keep it for the sentimental value. I was okay with that. 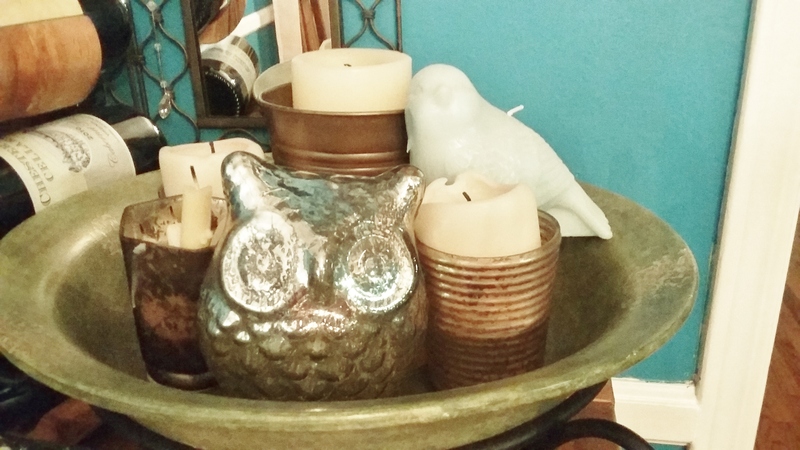 I happened upon these cute little paper mache owls and birds at the Dollar Tree – I kid you not. I will admit that I frequent the Dollar Tree for gift-wrapping supplies. Why spend $5 on a bag when you can get one for $1? I just don’t get it. 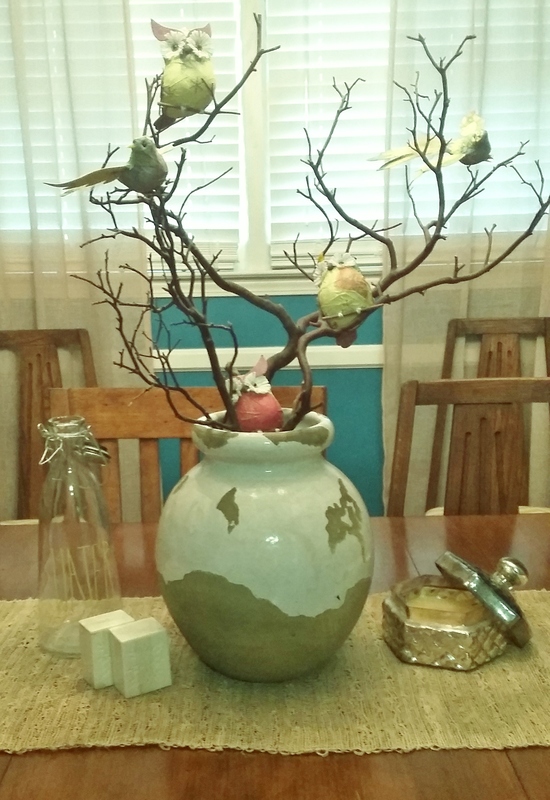 Anyway, these owls and birds were calling my name and I found the most perfect spot for them on the twigs. The water carafe came from Target and since it’s hard to see I’ll just tell you that it says WATER on it in yellow print, which for some reason makes it even cuter. Throw in a salt & pepper shaker and a mercury glass candle and call it a day. 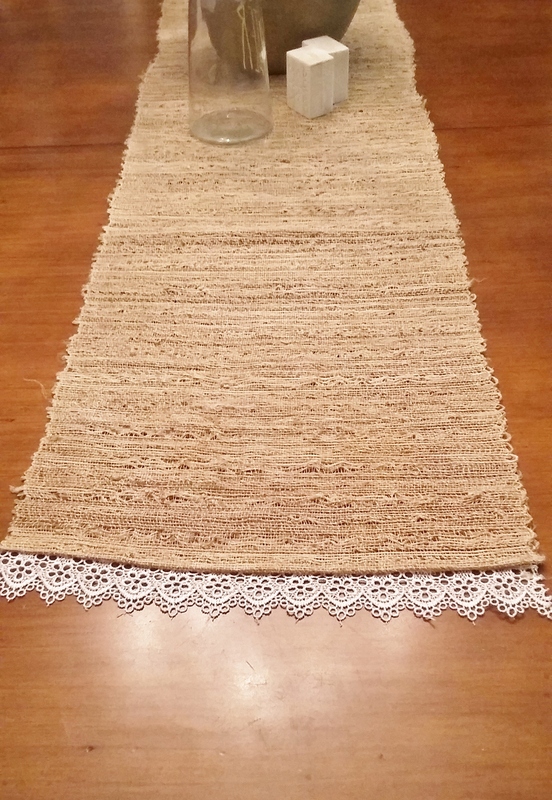 I bought the burlap-ish table runner from Target, but it just looked too plain on the table so I did a little DIY and glued some lace to the edges – perfection (at least in my eyes). The mirror may not look like anything exciting, but it’s actually made up of 9 smaller mirrors hung together. My mom and I found oodles of them at some store that doesn’t even exist anymore and she had the bright idea of grouping them together into one large mirror. It’s bugging me to no end that I can’t remember the name of the store. It was one of those stores that had everything from clothing to nail polish and hair accessories to random home decor items at a super cheap price. I sometimes wondered if the stuff was stolen, but I’m sad to say that didn’t stop me from shopping there. 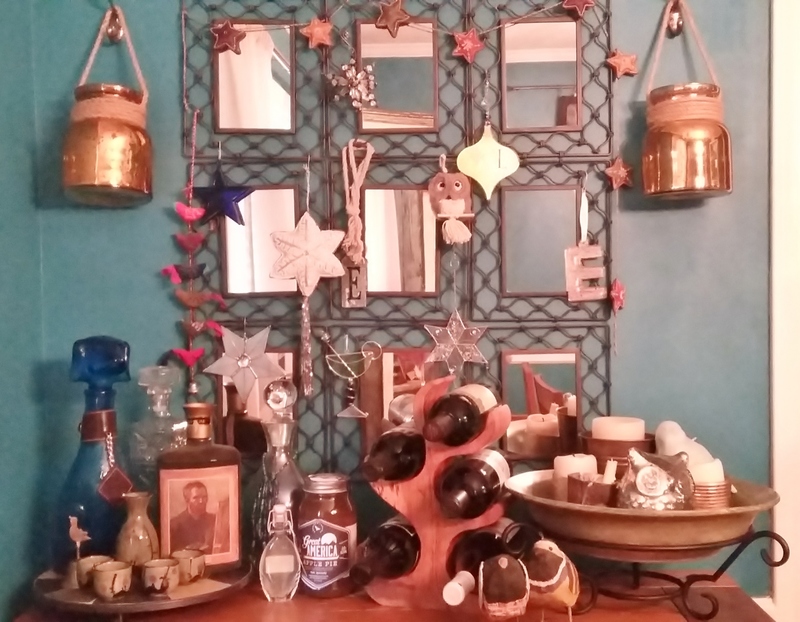 As you can see from the pictures, I love adding decorations to the mirrors – all the way from funky garlands to Christmas ornaments that aren’t really “Christmas-y” to fun initial decor. It might be getting on the verge of tacky at this point. I wanted to do something a little different when it came to the sconces so I found a couple mercury glass vases at Homegoods (which just happened to have rope already conveniently wrapped around them) and I hung them from decorative hooks found at my local Home Depot – so although they don’t add any value in the lighting area, I think they look pretty darn good. 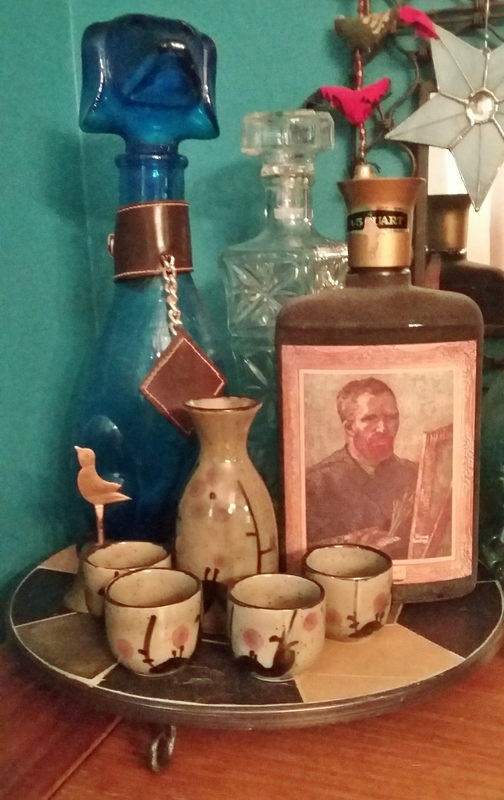 Decorating the bar was almost as fun as decorating the china cabinet that’s not really a china cabinet (see previous post). My mother-in-law gifted me with the bowl on the stand for Christmas one year. I loved it as soon as I opened it – the colors in the bowl were right up my alley. I had a tough time deciding where to put it but when I realized I needed something to display some candles in, I thought it would work perfectly. 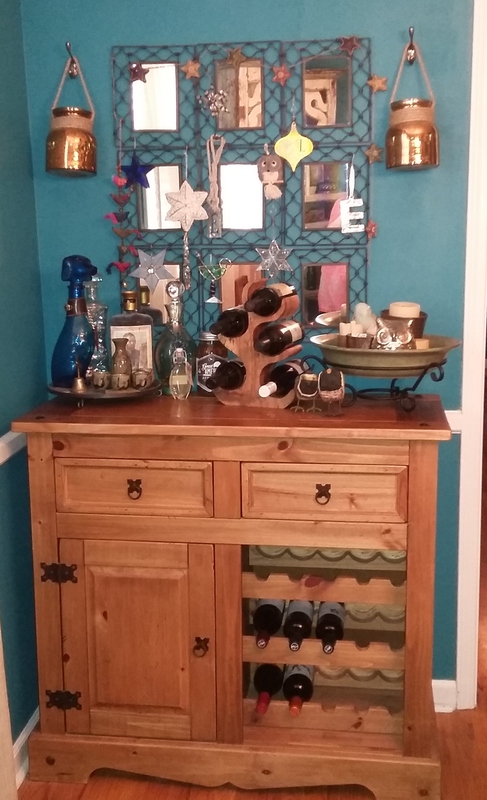 The wine rack was handmade by my oh-so-talented brother (yes, the same one that has done the majority of the hard work on the house). 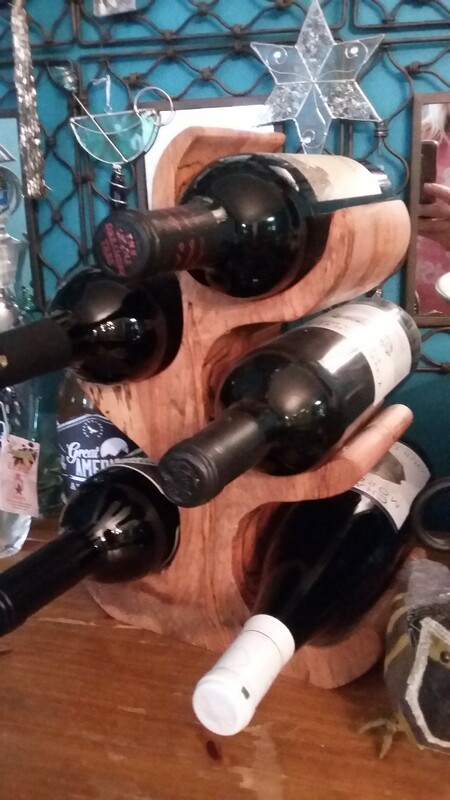 It’s seriously the most beautiful wine rack I have ever seen. I’m telling you there’s no limit to what he can do. I decided to display the remainder of the antique decanters from my mom’s side of the family because they were just too cool to leave in a box. I mean, the Van Gogh? The dog? How awesome are these? What’s even better is you can still smell the alcohol when you open the tops – you can’t taste it though which was kind of a bummer. The little antique bird bell had been my Grandmother’s and I thought it was too cute not to display, besides it has a bird on it and if you don’t know by now I kind of have a thing for birds. The chandelier came from a house that my dad and brother flipped way back when. I honestly can’t even remember when it was, but I do know that I was pretty far away from having my own place at the time. That didn’t stop me from asking if I could keep the chandelier though (I’m not kidding when I say I’ve been designing rooms in my head since I was little). I knew someday it would look just right in my dining room. It was originally a not-so-pretty brassy color, so I lightly spray painted it with a layer of black spray paint and then did a layer of metallic bronze spray paint on top. I absolutely love the bubbled glass bulb covers. I honestly didn’t have a lot of empty wall space left to fill, so it didn’t take much wall art to make the room complete. 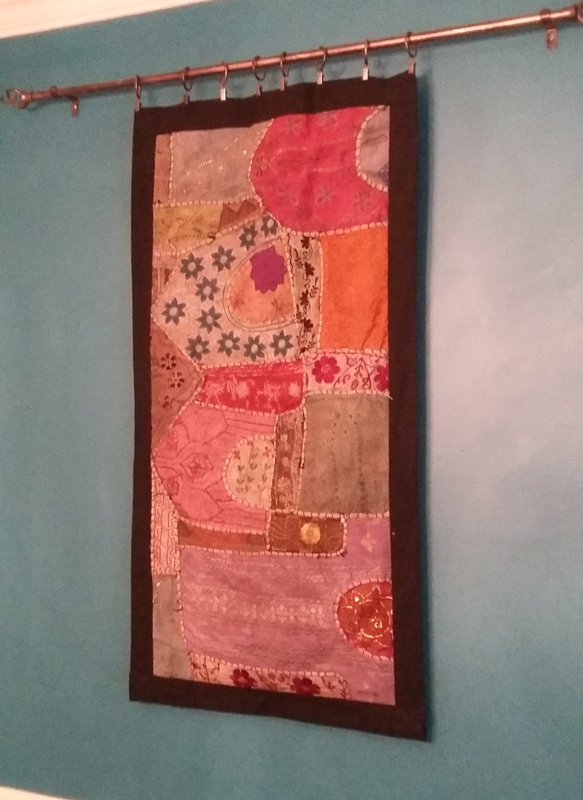 I had this fabric tapestry in my craft closet for the longest time because I had never found the right spot for it in our house, that is until the dining room got made over. 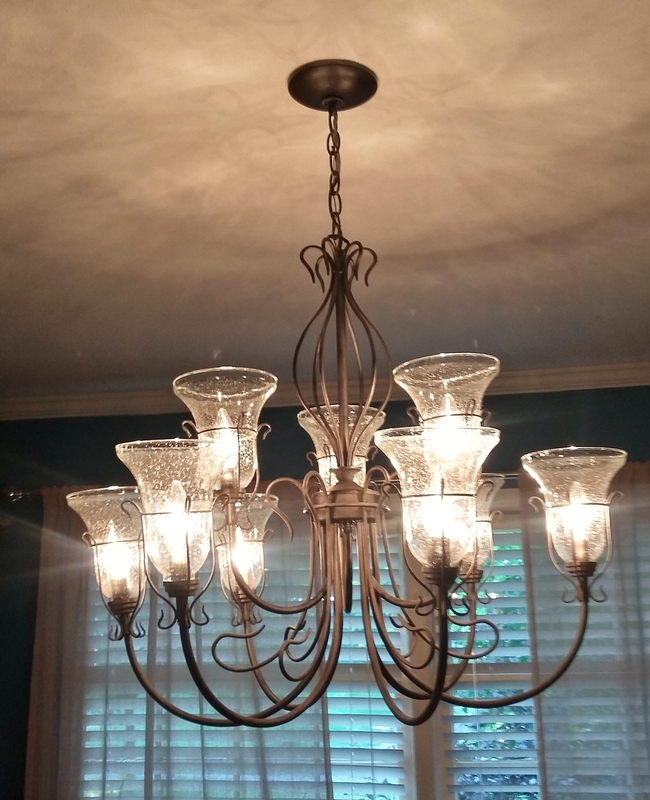 I bought a cheap curtain rod and curtain rings and worked some magic with the spray paint to make everything match the chandelier. 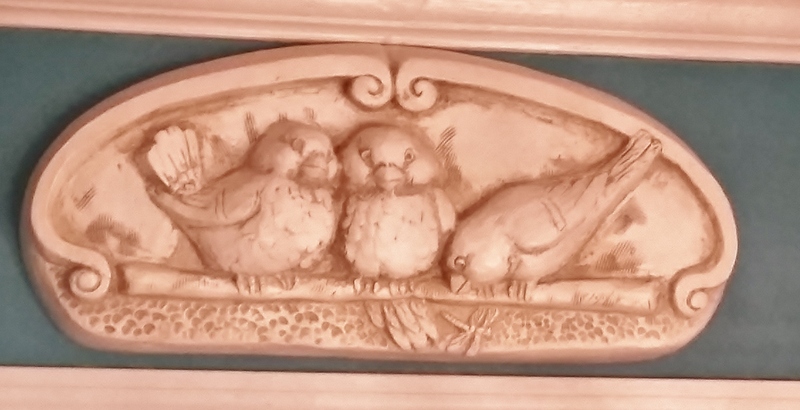 The plaster birds were a gift from my mom. I knew instantly they would hang above the door frame between the dining room and kitchen, and what do you know … they happened to fit just right. I remember being paranoid for about a week after I hung them because man were they heavy! But no worries, no birds fell on any heads. I just love everything about your dining room! You have such a good eye for putting things together! I still need major help with my bedroom….its stalled out again!